Not long ago, SEGA made news by publicly broadcasting an apology to gamers. Quality was down, products were suffering, and the once exceptional games that the company was known for were nowhere to be seen. There was a pledge to improve, a promise to regain gamers’ trust, and a commitment to build Sega into the superlative developer it once was. What with the acquisition of Atlus, a number of exciting project announcements, and delaying games that need improvement, things certainly seem to be moving in the right direction at SEGA. They’re listening to their fans and looking to make people happy, and one of the first games released under these new directives is almost upon us. 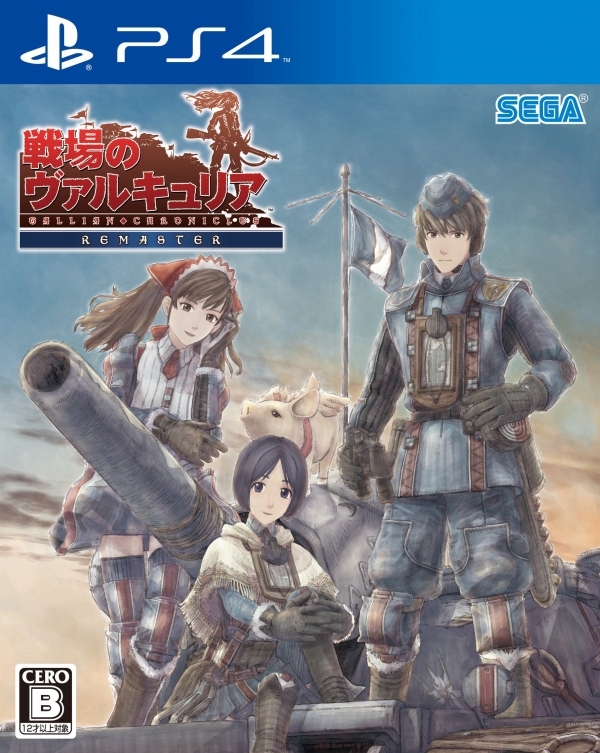 We’ve been fans of Valkyria Chronicles for a long time, so when SEGA announced it was releasing a remastered VC on PlayStation 4 we were really excited. This incredible strategy-RPG released in the early days of the PlayStation 3, and while many gamers missed out, it’s regarded by those in-the-know as one of the best games of the PS3 era. 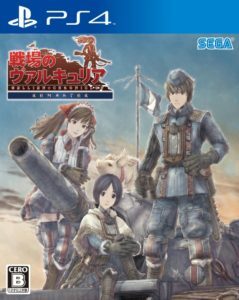 With multi-language audio, 1080P/60FPS visuals, trophy support, complete DLC, and releasing in both physical and digital forms, SEGA has gone all-out with Valkyria Chronicles Remastered. 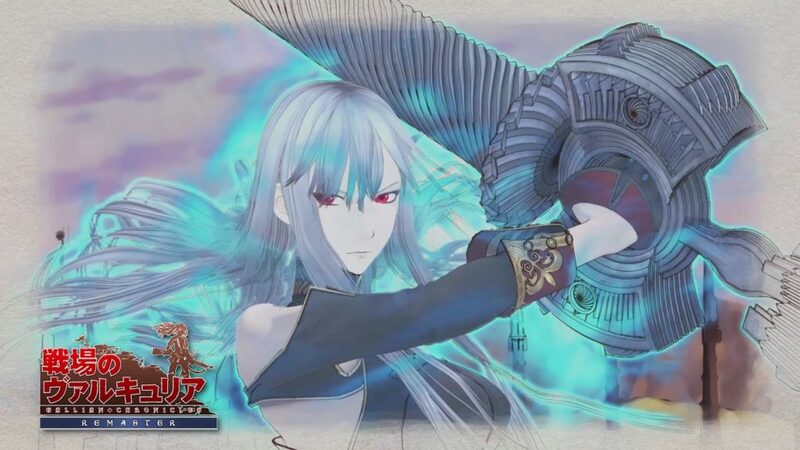 It’s clear that the company has high hopes that a new generation of gamer will buy into the magic of Valkyria. Releasing in less than a month, we’ve been putting solid hours into our preview copy. But does this hidden gem from 2008 still impress today? 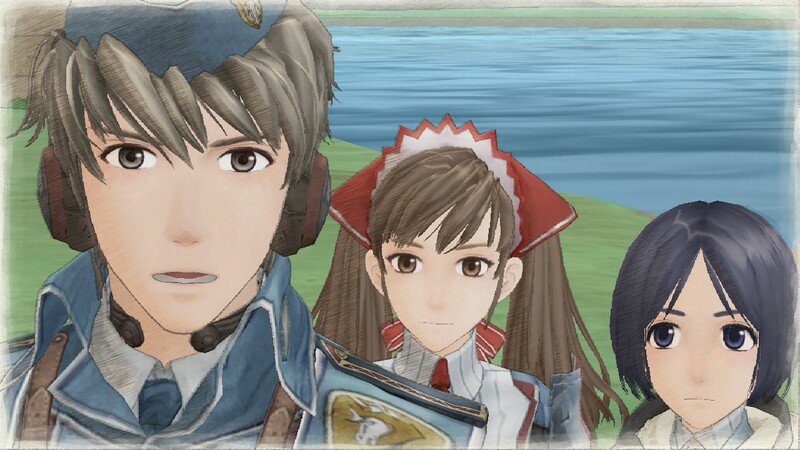 Valkyria Chronicles Remastered is a strategy-RPG that tells the story of a fictionalized, historic Europe in the throes of war and chaos. Two massive empires are waging a devastating war over limited supply of a precious mineral known as Ragnite. As the eastern and western empires engage in industrial-scale warfare, a tiny, neutral principality known as Gallia is caught in the middle. The story opens as citizens of Gallia prepare to evacuate towns near the front. A suspicious traveler passes absent-mindedly through town, runs into the local town watch, and is brought in for questioning. Before being pitched into a jail cell, however, the Empire attacks. In short order, the traveler is revealed to be the son of a former Gallian military hero, and he and the head of the watch are instantly forced into action to save the people of their homeland. After this initial skirmish it’s clear things will never be the same, and if Gallia and its people are to survive, neutrality is no longer an option. 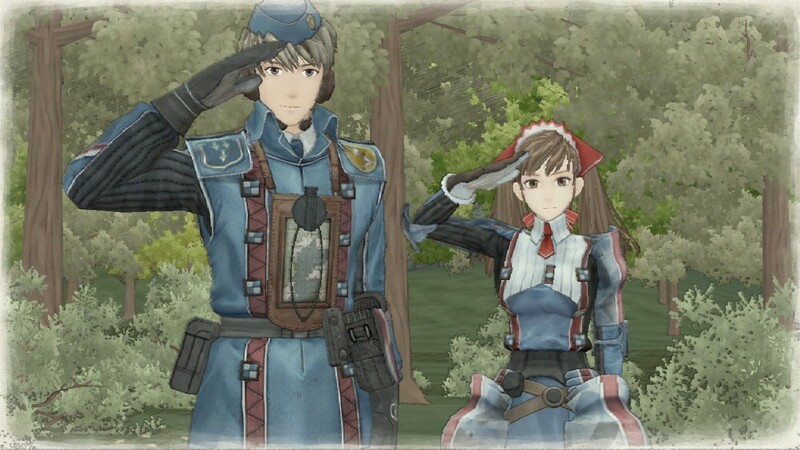 When we launch into Valkyria Chronicles Remastered on the PS4 we’re greeted with the glorious visuals that so instantly defined the PlayStation 3 version as something totally unique. In 2008, this game looked like nothing else out there. With a custom-built graphics engine, SEGA created a living, breathing watercolor on screen. The effect was impressive then and the passing of time has done little to negate its impact. This game is still gorgeous. VC favors an aesthetic that is classically Japanese. We’re not dealing with sickeningly cute chibi-characters or an art-style that’s so overzealously “anime” that it becomes distracting, but it’s obvious that we’re playing a Japanese game. For some, this will be perfect, and for others, not so much. But the character models, mechanical design, and overall look straddles the balance between realism and Ghibli quite nicely. For gamers who typically detest anime-style games, the art-style here should be conservative enough to be accepted while gamers who love anime and manga will feel right at home. Sound design is on point. As the war rages on we’re treated to thunderous explosions, mechanical whirring, panic-inducing ricochets, and deep authenticity. Voice acting is found throughout the game and it’s done to a level that borders on perfection. While there are occasional moments of clumsy scripting and lackluster delivery, these are rare. Mostly the words are acted with a heartfelt earnestness that goes a long way toward drawing emotion from even the most jaded gamers. This newly remastered version is also noteworthy for offering the choice between both English and Japanese dubs, something we know many gamers will appreciate. Gameplay here is as perfect as it was on the PS3 release; that is, perfectly perfect. For the uninitiated, VC gameplay is a blend of action, strategy, and tactical games. Real-time movement is seamlessly married to traditionally turn-based tactics in a unique system dubbed “BLiTZ” (Battle of Live Tactical Zones). The player and CPU alternate in turn-based movement using an overhead map that displays all units on the battlefield. When a unit is selected to be moved, the game instantly zooms in toward the map in a sweeping, Google Maps-like motion. 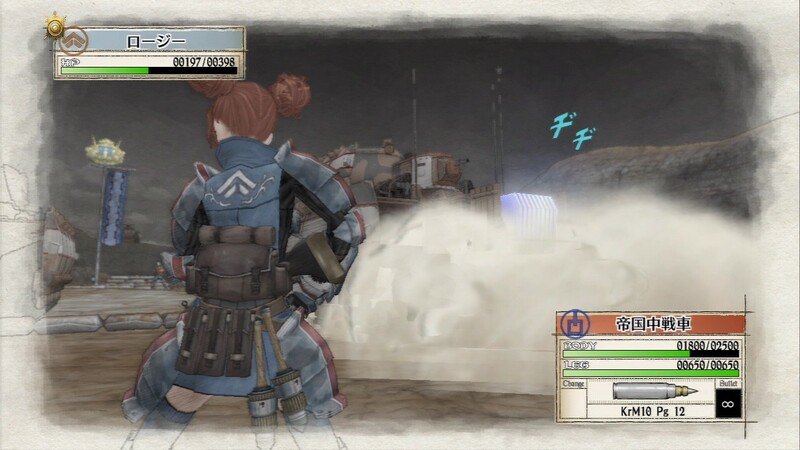 Once the camera has taken up position behind the selected unit, the player can control that unit as he or she runs in real-time along the battlefield. Depending on what the player is looking to accomplish this is a crucial aspect of the battle. If a character is near death, for instance, the player might wish to run for cover, select a healing item, and replenish that character’s health. If an enemy base-camp is undefended a player may wish to crest a hill and capture the enemy’s base. Or the player may want to take advantage of unique environmental features by having a sniper climb a water tower for better line of sight. It’s entirely up to the player. Movement is dictated by an AP gauge, which diminishes as the player walks or runs. When the gauge is depleted the character can no longer move. Actions are limited by a finite number of CP points allotted at the onset of each turn. When the player’s CP points are exhausted, it’s the CPU’s turn. When attacking, the player is in direct control of the chosen character’s weapon selection, aiming, and firing. There’s a really interesting percentage indicator that lets the player know of the individual character’s accuracy, critical-strike potential, etc. These and many more factors let the player assess the situation, weigh the pros and cons of a particular action, and plan tactically. But to say that that’s the full extent of VC‘s combat system is an incredible understatement. There’s a lot happening in this game. Infantry units carry certain strengths and weaknesses depending on their class; we have snipers, shock-troopers, scouts, lancers, and more. Additionally some classes can move further distances than others, can carry specific weaponry that may make them perfect for certain situations, and might suffer serious weaknesses against certain opposition. In addition to general class characteristics, each individual character in the game has a set of important modifiers. These are known as Potentials, and they’re certainly not passive. In fact, these dynamic traits are triggered by environmental factors within the game or by psychological factors within the unfolding battle. If a character dies, for example, other characters who shared a close emotional bond with that character might suffer severely, leading to diminished attack power. Or it could be something as simple as a character having a bad pollen allergy, or another character hating the rain. This trait system is pretty unique and decidedly interesting. The environments play a pivotal role in battles as well. Tall grass offers opportunities for stealth, sandbags offer opportunities for cover, ladders lead to sniping points, and tunnels offer protection from enemy line of sight. As things get more intense and tanks enter the fray, there’s even a number of environmental checks leveled against the iron behemoths. As if all this wasn’t enough, the player is also able to issue “Orders” that heavily influence the course of battle. 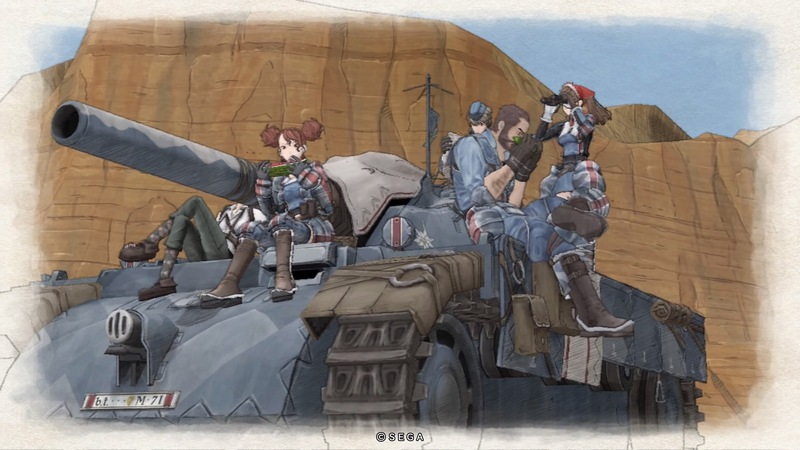 These can range from buffing individual characters, to calling in medics, or bringing about artillery strikes. Victory in battle results in the awarding of Experience Points, materials for upgrading weaponry, and cash for upgrading characters. The depth of customization of the player’s tank and characters is exceptional, and there’s enough here to keep people tinkering for a while. Thankfully, this aspect of the game is reigned in before it becomes overwhelming. Again, the game strikes a good balance. The first hour of our play-through has seen us experiencing the opening salvos in a massive war. We’ve learned a really enthralling, deep, and extremely rewarding battle system. We’ve met some incredibly engaging characters and scraped the surface of their uniquely realized stories. We’ve launched offensives that were carefully planned, perfectly executed, and instantly successful. And we’ve launched offensives that were entirely rebuffed by a super-capable CPU opponent, and learned from our mistakes. We’ve died a few times, blown up some enemy tanks, defended a picturesque town, and glimpsed the beginnings of a rich story filled with loss, struggle, and courage in the face of overwhelming oppression. Sounds like the perfect start to an amazing game, right? We think it just might be. So why didn’t the original VC light up the sales charts? We’re not sure, but we have some anecdotally backed theories. The anime-style aesthetic has always been a polarizing one for Western consumers. Some people just can’t see past the colorful visuals to the rich story beneath. The fact that VC released relatively early in a brand new console’s lifecycle certainly didn’t help its numbers. And lastly, while a lack of trophy support today seems like something that would do little to dissuade a gamer from buying a game, that’s exactly what happened. The original release lacked trophies, and we distinctly remember countless buyers demanding trophies be added, and decrying the game over its lack of digital back-pats. But this time could be different. When SEGA re-released VC on Steam the game was wildly successful. Today, SEGA is hoping for even bigger things for the franchise. This is the first time that VC has been widely distributed on a major console. With a physical release, a special edition, and digital distribution through PSN, it’s obvious that SEGA is pushing to offer a game of uniquely high caliber to as many new users as feasibly possible. This looks to be the opening salvo in SEGA’s plan to create nothing but exceptional content and regain gamers’ trust. Will VC Remastered light a fire in the hearts of gamers who may have missed it nearly a decade ago? Time will tell. If our first hour with the game is anything to go by, it would be downright criminal for gamers to overlook what might be the best strategy-RPG in a console generation. Valkyria Chronicles Remastered releases on PlayStation 4 on May 10. You can pre-order your special edition physical copy today via Amazon. has a real passion for all things uniquely SEGA. A longtime contributor to SEGA Nerds, he focuses on original articles and that wonderful area where SEGA and the PS Vita converge. When not on SEGA Nerds he spends his time building motorcycles, snootily sipping espresso, and writing. His personal website is interested in vintage photography gear, and can be found at Casual Photophile.